Welcome to the Pinkfresh Studio 5th Birthday Blog Hop Celebration! I’m so thrilled to be a part of this delightful celebration and to share a couple of floral cards I made using Fancy Floral Die Set. If you arrived here from Kathleen Graumüller’s blog you are on the right track! I die cut the Fancy Floral 1 from vellum paper, the Fancy Floral 2 from white card stock. I then glued them together using fine tip glue pen. For card base, I ink blended onto it with Fossilized Amber, Worn Lipstick, and Cracked Pistachio Distress Oxide Inks. I then mounted the Fancy Floral panel using foam tape. For the sentiment & flowers on the centre of the card front, I used Everyday Musings Scrapbook Ephemera Pack – love them all so much!! Here is another card with the Fancy Floral 2 Die. I die cut the Fancy Floral 2 from white & green apple card stocks first. Next, I adhered the white Fancy Floral panel over red card front using fine tip glue pen, and then partially inlaid green coloured die cuts in place. For the sentiment, I also used Everyday Musings Scrapbook Ephemera Pack. 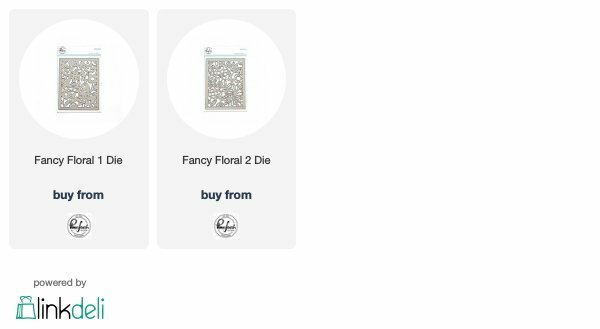 Fancy Floral 1 & 2 Dies are my all-time favourites!! 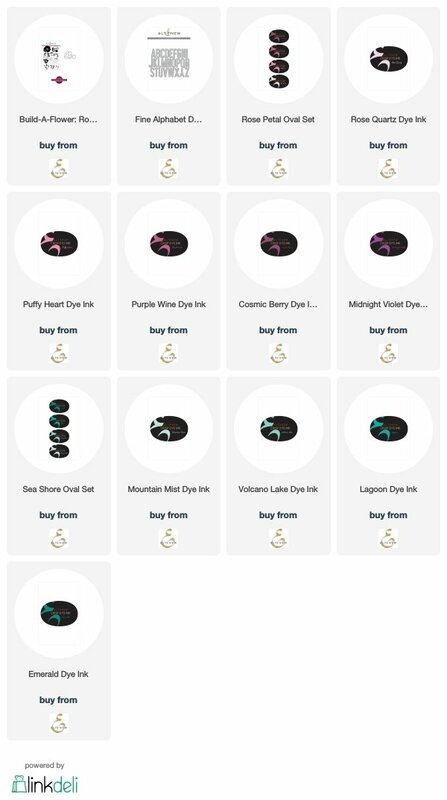 Pinkfresh Studio will be 3 Grand Prizes picked from the Pinkfresh blog: Liquid Watercolor full set, Set of our 3 current paper collections, and the entire April Essentials die release (will release the Monday after the birthday blog hop). Also, each one of the designers is giving away a $25 gift card to the Pinkfresh Studio store – the winners will be picked from the comments. All winners will be announced on the Pinkfresh Studio GIVEAWAY PAGE on Sunday, April 14th. Please check that page & claim your prize within 2 weeks. A FREE XO Word Die with purchase of $25+. There is no code necessary, and the die will automatically load into their cart while supplies last. We will also be offering free/discounted shipping from April 5-7th on orders $25+. They must use the code FREESHIP5THBDAY. Shipping is free in the USA, and $5.50 off for our International friends! Thank you so much for stopping by. Hope you enjoy all the fabulous inspiration from the hop! Today I want to share with you a couple of cute bunny cards using the new SSS Bunny Wishes Stamp & Die Set. For my first card, I made a birthday bunny card. I stamped Bunny (with balloons) & chick from the Bunny Wishes Set on white card stock using Memento Tuxedo Black dye ink, coloured them with the Altenew Artist Markers, and then die cut them with the matching dies. I die cut the Stitched Whirl Panel from white card stock, then added clouds using the Clouds For Days Stencil. For the sentiment, I used the Simple Sentiments 2 Stamp Set. Bunny floating with balloons. What a cute bunny!! For my second card, I made a simple baby card with the Bunny Wishes Stamp & Die Set. I simply stamped a cute image with black dye ink, coloured them with alcohol markers, and then die cut them with matching dies. I lightly inked up the card front with Tattered Rose Distress Ink, stamped the sentiments, and then adhered all coloured images using foam tape. Thank you so much for stopping by. Have a great day! Keep smiling and be blessed. God bless you all. Welcome to the first day of the Pretty Pink Posh 5th Birthday Celebration (and January 2019 Release) Blog Hop – it lasts for 3 days!! You may be starting the hop here or coming from Thi Lam’s blog and seeing her beautiful cards, either way I hope you enjoy all the fabulous inspiration from the hop! For my first card, I’m featuring Pinata Party Stamp Set, Cupcake Critters Stamp Set, and Decorative Tag 2 Dies. For my colourful background, I heat embossed cute images from the Pinata Party set on watercolour paper panel in white, inked up the panel with Picked Raspberry, Scattered Straw, Crushed Olive Distress inks, and then added a bit of watercolours. I die cut arch window from a separate watercolour paper using the Decorative Tag 2 dies, then lightly inked on it with Antique Linen Distress ink. I decorated it with a few Valentine Jewels Mix. We can open the window, it means we can add something of a surprise inside the window. Ta-da!! Happy birthday to you! I stamped & watercoloured these cute birthday critters using the Cupcake Critters Stamp & Die Set. I love the Decorative Tag 2 Dies so much – it’s my most favourite among entire January release products. For my second card, I’m featuring Crocus Flowers Stamp Set and Scallop Hearts Dies. I stamped flowers & leaves from the Crocus Flowers set on watercolour paper panel using black dye ink – I used Post-It Notes for masking images. I then coloured all stamped images with Faber-Castell polychromos colored pencils. I applied the Scallop Heart Die over the coloured images, then inlaid all pieces in place as shown in the picture. I decorated the Scallop Heart with small sized Valentine Jewels & Sugar Plum Jewels. 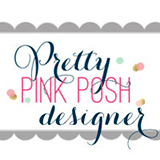 Pretty Pink Posh is giving away $25 gift certificates to those NINE people who comment during the blog hop. Plus, PPP is giving away a not-yet-released set for qualifying purchases (while supplies last)!